Dr Marie Stopes and Mr Humphrey Roe opened the first birth control clinic in the British Empire on 17th March 1921. Sir James Barr recognised that dispensing contraceptives could be the check on the propagation of undesirables that he had sought. On the eve of Stopes’ Queens Hall address on Tuesday May 31st 1921, Barr wrote a letter of congratulation. I am exceedingly sorry that I shall not be able to attend your great meeting on May 31, which I hope will prove historical. You and your husband have inaugurated a great movement which I hope will eventually get rid of our C3 population and exterminate poverty. The only way to raise an A1 population is to breed them. 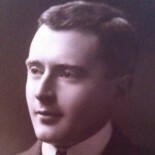 He accepted Stopes’ invitation to become a Vice-President of the society to run the clinic: the Society for Constructive Birth Control and Racial Progress. This entry was posted on 28 February 2018 by markhsutherland in Eugenics, Sir James Barr.